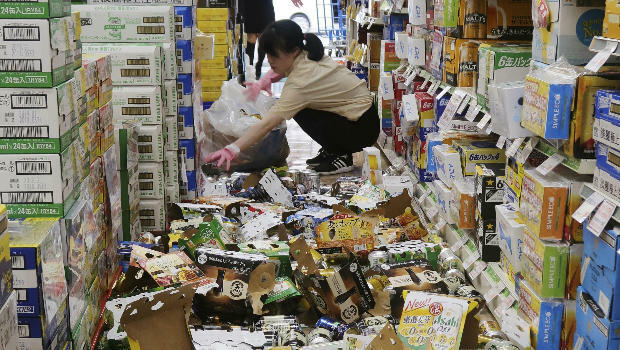 TOKYO -- Residents in western Japan were cleaning up debris Monday evening after a powerful earthquake hit the area around Osaka, the country's second-largest city, killing four people and injuring hundreds while knocking over walls and setting off fires. The magnitude 6.1 earthquake that struck the area early Monday damaged buildings and left many homes without water or gas. The quake also grounded flights in and out of Osaka and paralyzed traffic and commuter trains most of the day. Takatsuki city confirmed another victim late Monday, as the death toll rose to four. City officials didn't have details of the victim, but NHK and Kyodo News reported that an 81-year-old woman was found dead underneath a wardrobe that fell on her at her home in Takatsuki. Mayor Takeshi Hamada apologized over her death because of the wall's collapse. The city acknowledged that the wall did not meet building safety codes. The structure was old and made of concrete blocks - a known risk in earthquakes. Chief Cabinet Secretary Yoshihide Suga ordered the Education Ministry to conduct nationwide safety checks of concrete block structures at public schools. BBC News cites officials who say another tremor could happen in the next few days. BBC News also notes that several key industrial areas near Osaka were affected. Companies like Panasonic and Daihatsu are suspending production at their affected sites.